Third Quarter Billings Remain Sub-par While Inquiries Pick-up. Survey results at the end of the third quarter showed advancement from the scores recorded at the end of the second quarter. While the September score of 49.2 was greater than the mid-year June score of 45.9, it suggests that industry revenues are not in an expansionary mode (scores above 50 indicate an increase in billings, while those below 50 indicate a drop in billings). The strong March IDBI score of 58.5 remains a high point for 2018. The new project inquiry three-month moving average score increased to 53.4 in September, up from a June score of 50.8. Billings’ Growth Shows Mixed Results Across Size Cohorts. Small and large firms reported sub-50 three month moving average billings scores for the third quarter, while medium-sized firms employing between 2 and 24 people reported strong IDBI scores in the high 50s. 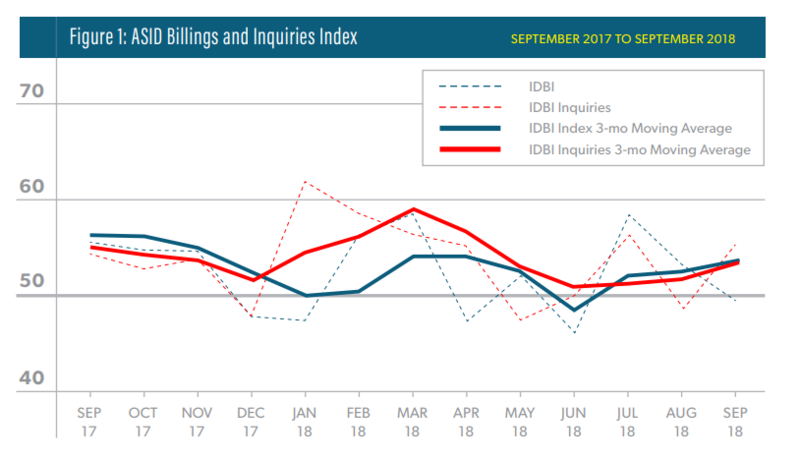 Looking across regions, third quarter IDBI billings increased compared to second quarter scores. On a 3-month moving average, firms in the Midwest (56.1), South (55.6), and West (54.5) maintained positive billings growth. Design firms operating in the Northeast slid to a 46.2 score and have maintain a pattern of reduced billings for the past eleven months. Third Quarter Billings Uneven Across Market Sectors. Single-family (47.3) and multifamily (47.6) residential project scores remain below the expansionary scores reported for the same period a year ago. Institutional sector billings rose into positive territory (50.0), while Commercial sector billings recorded an IDBI of 40.3, indicating a continued slide since March. Six-Month Outlook: Stronger Business Conditions Expected. Interior designers are optimistic about near-term business conditions with 92 percent of respondents believing conditions will be about the same or better than they are now. Although the six-month business conditions index score for September of 54.6 is down from the March score of 62.7 and the June score of 59.6, the outlook for the design industry remains favorable despite a measured decline in expectations from the second quarter based on the IDBI and the Dodge Momentum Index. The direction of consumer attitudes about the future, as measured by the Conference Board’s expectations indicator, is in direct contrast but is expected to soften and align with other measures within the next month or so. Pace of Construction Spending Decelerating. Total U.S. construction spending in August 2018 was $1.32 trillion at a seasonally adjusted rate of 6.5 percent higher than in August 2017. Private residential construction spending has decelerated for single and multifamily housing starts according to the most recent Census Department Construction spending release. Rising interest rates and higher material costs are affecting construction spending. Labor Market Continues at Solid Pace. The employment market remains solid well into its ninth year of expansion. U.S. monthly employment gains averaged 190,000 in the third quarter. Nonfarm payroll employment increased by just 134,000 in September, the slowest monthly pace in one year, and weather conditions, specifically Hurricane Florence, likely pushed the quarterly data lower. There was an addition of 1,800 jobs in design services in August 2018 compared to August 2017, and similarly, architectural jobs added 8,300 positions over the same period. According to Jack Kleinhenz, ASID economist: While we have seen moderation in growth for the design industry in 2018, it is too early to say that it has peaked. Recent softening trends in home sales, new home construction, and home improvement seem to be disconnected from the strength exhibited in the overall economy and are perplexing. Going forward, these conditions are likely to continue, but overall business conditions remain favorable. Click here for the complete report with graphics.